The Software presented here is an Image Resizer software utility for windows operating system users. Apart from resizing single or multiple image files, this Image Resizer can be used to convert image files to jpg, gif or png file formats. This single screen software can be really easy to use and understand and can be used to resize files in a batch altogether or even by selecting a single file. Have a look at the screenshot below which displays the Image Resizer in initial format. Whether you are using Windows XP, Windows Vista, Windows 7 or even Windows 8, this image resizer can be really a handy tool and works good on all windows operating systems. You can download & try out this Image Resizer for free now. In order to resize a single image file, click on the Browse button of the software, select an image file and click on the Convert button. You can also specify the new file format by selecting either of JPG, PNG or GIF file formats. Input to the Image Resizer can be in any file format including jpg, jpeg, gif, png or even a .bmp file format. In case you would like to resize and convert multiple files easily and quickly, open up the source folder in windows explorer. Select all the files you wish to resize and convert them into the desired file format. 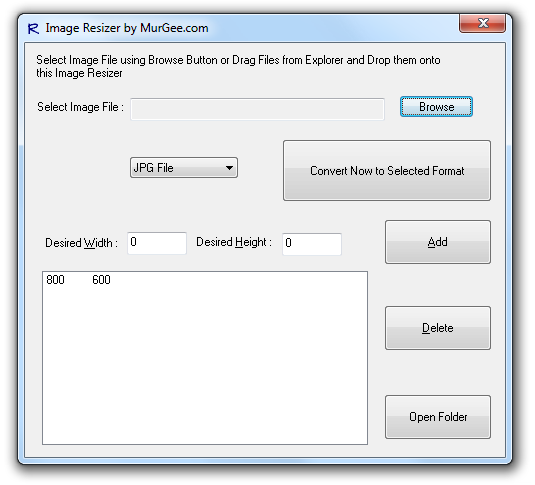 Drag the selected files from Windows Explorer and Drop the files on the user interface of the Image Resizer. Once you drop single or multiple files onto the main interface of the software, the software will automatically start converting and resizing the selected files to the desired file formats. Once the image conversion and resizing is complete, the folder where the new files are present will be opened automatically by the software. In order to resize selected image files to multiple resolution files, all you need to do is just add the desired image resolution in the width and height edit boxes and click on Add. When you start the software first time, you will notice an image resolution of 800 by 600 already added to the Image Resizer target image resolution list. This Image Resolution list stores the desired new sizes of the converted images, is an editable list and gets saved automatically. You can open up the folder containing the resized and converted images by clicking on the Open Folder button which is at the bottom right corner of Image Resizer. Yes this software works well on 32 bit and 64 bit versions of Windows 7, Windows 8, Windows Vista and even on older operating systems such as Windows XP, etc. For quick and easy image resizing, launch the software and pin it to the taskbar of Windows 7 or Windows 8, in other versions you can launch this software from the programs menu or with a desktop shortcut. This Image Resizer software is provided on a free to download and try basis. The Software will not ask you to enter your email id or fill any complicated forms and during the trial the software will be fully functional and will not display you any popup or reminder to buy the software. Multiple input file formats, multiple output image resolutions, single image resize option, multiple images resize with easy to use drag and drop and selectable output file format makes this free to download Image Resizer a must to have software utility for Windows 7, Windows 8, XP, Vista and other Microsoft Operating Systems.